December 1, 2011 - A former executive of a Peruvian airline pleaded guilty on Wednesday for his role in a conspiracy to fix surcharges on air cargo shipments from the United States to South and Central America following Hurricanes Katrina and Rita, the Department of Justice announced. George Gonzalez, former chief commercial officer of Cielos Airlines, a Peruvian air cargo carrier, pleaded guilty on Wednesday in the Southern District of Florida to a one count charge of price fixing. 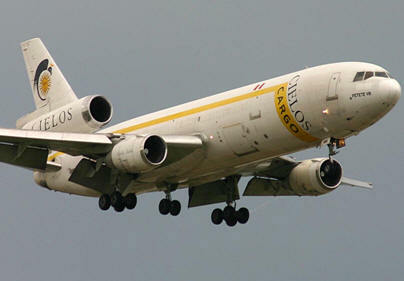 On Oct. 28, 2010, Gonzalez and three other former airline executives were charged in Miami with conspiring to suppress and eliminate competition by agreeing to impose an increase to their fuel surcharges on air cargo shipped from the United States to locations in South and Central America. The indictment charged the executives with participating in the conspiracy beginning in or around late September 2005 until at least November 2005. Air cargo carriers transport a variety of cargo shipments, such as heavy equipment, perishable commodities and consumer goods, on scheduled international flights. On Sept. 19, 2011, two of the other indicted former airline executives pleaded guilty to the charge. Guillermo ?Willy? Cabeza, former president of Arrow Air, a Miami-based air cargo carrier, and Luis Juan Soto, former president of South Winds Cargo, a Miami-based air cargo carrier, pleaded guilty to the charge and are awaiting sentencing. In connection with their pleas, Gonzalez, Cabeza and Soto have each agreed to cooperate with the department in its investigation and to pay a criminal fine. Gonzalez, Cabeza and Soto pleaded guilty to price fixing in violation of the Sherman Act, which carries a maximum $1 million fine and up to 10 years in prison. The maximum fine may be increased to twice the gain derived from the crime or twice the loss suffered by the victims of the crime, if either of those amounts is greater than the statutory maximum fine. A total of 22 airlines and 21 executives, including Gonzalez, Cabeza and Soto, have been charged in the Justice Department?s ongoing investigation into price fixing in the air transportation industry. To date, more than $1.8 billion in criminal fines have been imposed and four executives have been sentenced to serve prison time. Wednesday?s guilty plea arose from an ongoing joint investigation into the air transportation industry being conducted by the Antitrust Division?s National Criminal Enforcement Section and the Chicago Field Office, the FBI?s field offices in Miami and Washington, D.C., the Department of Transportation?s Office of Inspector General and the U.S. Postal Service?s Office of Inspector General. Update - On April 25, 2012, George Gonzalez, former chief commercial officer of Cielos Airlines, a Peruvian air cargo carrier, was sentenced in U.S. District Court, Miami Florida. Mr. Gonzalez received a split sentence of 5 months at a Bureau of Prison facility; 5 months home detention and monitoring; 3 years probation; a $20,000 fine; a $100 assessment; and 100 hours of community service.